An apparently healthy 70-year-old man reported with a painless mass in the left lower lip of 5 months' duration. On examination, a solitary, soft to firm submucosal swelling measuring about 0.5 mm × 0.5 mm was present on the left lower lip. Clinical differential diagnosis included focal reactive growths, organizing mucocele and benign mesenchymal tumors. The lesion was excised and subjected to histopathological and immunohistochemical analysis. Macroscopically, the lesion was whitish brown in color, measuring about 1 cm × 1 cm, soft in consistency and irregular in shape. 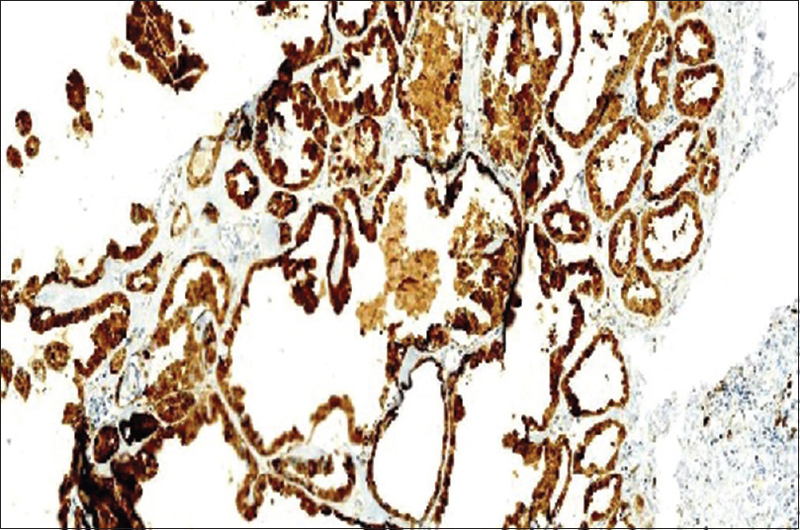 The multiple sections from the lesion showed a well-circumscribed tissue with multiple, irregularly defined lobules composed of variably sized collections of ducts with cystic changes surrounded by hyalinized tissue [Figure 1]. 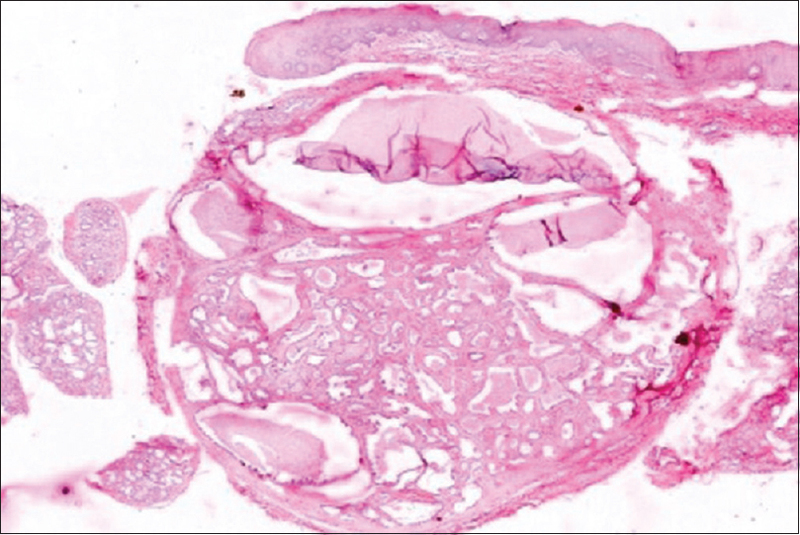 Microcystic duct-like spaces were lined by flattened to cuboidal epithelium with occasional mucin containing squamous, vacuolated and apocrine-like metaplasia [Figure 2]. Some of these lining cells showed subtle cytoplasmic granules. Perilesional area shows minor salivary glands with occasional lesional duct-like infiltration along with sparse inflammation. Finally, histopathological diagnosis of sclerosing polycystic adenosis (SPA) was rendered. Sections were also subjected immunohistochemical staining for S-100 and calponin as an adjunct to the diagnosis. The patient was followed up for 24 months and is currently free of the lesion. Till date, not more than 60 cases of SPA have been reported in the available literature. In almost all reported cases, major salivary glands were involved, except in five cases where minor glands were involved., Clinically, SPA is known to present as a painless swelling of varying size. Lesions of minor glands are known to be subtle or minimal sized mucosal nodules, as was found in this case. Previous cases of oral SPA were reported on buccal mucosa, floor of the mouth and palate while the present case in the lower lip. It is reported to occur more in females; however, the present case was in a male patient. Microscopically, there is a great variability in the features of SPA. Histologic examination shows a well-circumscribed, partially encapsulated mass with preservation of the lobular architecture and variable amounts of inflammatory infiltrate in a sclerotic stroma. Multiple dilated ducts are often lined by a flattened bilayered epithelium. The ductal cells of SPA show variable cytomorphologic characteristics including foamy, vacuolated, apocrine, mucous, clear, squamous, columnar and oncocyte-like cells. The hallmark of the tumors is the presence of large acinar cells with numerous coarse eosinophilic PAS-positive cytoplasmic granules. Some ducts contain solid and cribriform epithelial proliferations with vacuolated foamy cells having a sebaceous-like appearance. Some cases exhibit focal intraluminal epithelial proliferation giving rise to solid, microcystic and cribriform structures. The current case exhibited multicystic pattern with ductal cells wavering from mucous, vacuolated and apocrine to foamy in appearance. In most cases, nuclear pleomorphism has been noted, ranging in severity from mild to severe and sometimes amounting to low-grade ductal carcinoma in situ. However, in the present case except for hyperplasia of ductal cells, no feature of dysplasia or carcinoma was seen. 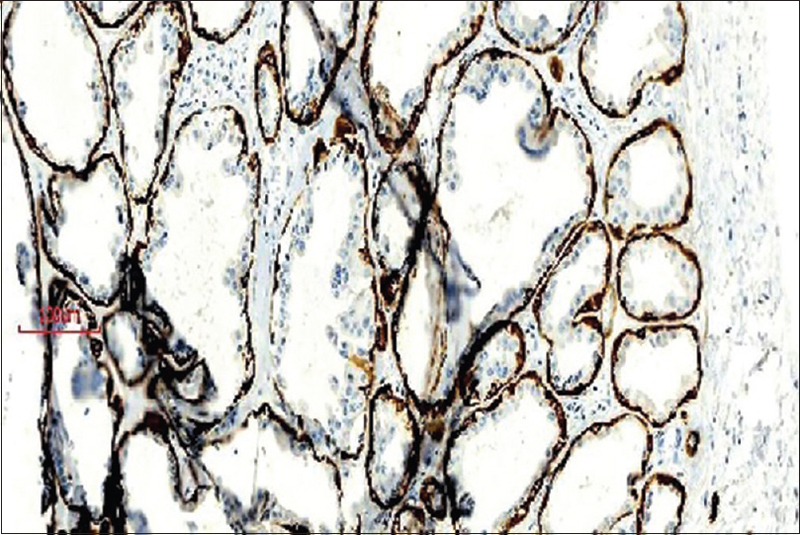 The immunohistochemical characterization of ductal and acinar cells is shown to be positive for cytokeratin (AE1-3 and CAM5.2), variably positive for epithelial membrane antigenS100 protein, antimitochondrial antibody and negative for carcinoembryonic antigen, p53 and HER-2/neu. One study demonstrated positivity of acinar cells with coarse eosinophilic cytoplasm for GCDFP-15. The flat cells surrounding the ducts filled with hyperplastic and dysplastic epithelium have been shown to be positive for smooth muscle actin, p63 and calponin suggesting their myoepithelial nature. Interestingly, the present case showed strong expression of S-100 by both ductal and peripheral [Figure 3] while calponin expression remained confined only to peripheral cells [Figure 4]. The histopathological differential diagnosis for SPA ranges from reactive, benign to malignant entities. 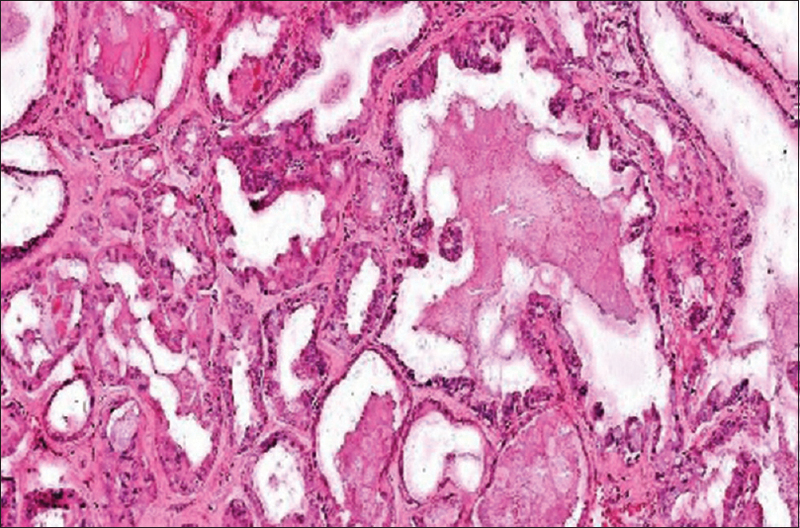 Malignancies such as mucoepidermoid carcinoma, salivary duct carcinoma and acinic cell carcinoma may also be ruled out based on their classical histologic patterns and cytomorphologic features. Previously SPA was considered as pseudoneoplastic or inflammatory lesion however features such as cellular atypia and recent findings of HUMARA assay suggest its clonal nature prompting to consider as a neoplasm. Oral pathologist should be familiar with clinical, histological and immunohistochemical features of SPA so as to avoid misdiagnosis. Skálová A, Gnepp DR, Lewis JS Jr. Hunt JL, Bishop JA, Hellquist H, et al. Newly described entities in salivary gland pathology. Am J Surg Pathol 2017;41:e33-47. Seethala RR, Stenman G. Update from the 4th edition of the World Health Organization classification of head and neck tumours: Tumors of the salivary gland. Head Neck Pathol 2017;11:55-67. Noonan VL, Kalmar JR, Allen CM, Gallagher GT, Kabani S. Sclerosing polycystic adenosis of minor salivary glands: Report of three cases and review of the literature. Oral Surg Oral Med Oral Pathol Oral Radiol Endod 2007;104:516-20. Hellquist H, Skalova A. Histopathology of Salivary Glands. Heidelberg, New York, Dordrecht, London: Springer; 2014.